Ok I have 4 totally different sources saying the heels and quarters on a spanish horse will be higher than other breeds... A farrier (diehard barefooter) I don't use (I do my own) did a couple of friends horses of mixed breeding and said that was "rubbish". The feet were cut back so much all the horses were so sore they huge trouble walking after. I will take some pics today and post them for your critique. :| got to be carefull with some of the barefoot trimmers. They get indoctrinated into trimming all heels as low as possible. I don't pay much attention to breed when I'm trimming, I just go by the foot type that I see. In the past two years I've actually started erring on the high side for heels as I find it causes much less discomfort and trouble than if I went a bit too low. I think maybe the thing with spanish horses having higher heels has to do with hoof angle. The more collected a horse moves typically the higher the natural angle. If you're not getting the toe short enough, they need a correspondingly longer heel to maintain that angle. It's all a big juggling game. I would say "yes spanish horses can have short heels" but with the caveate that you make sure to maintain the angle and not trim the heel shorter if you haven't also trimmed the toe. (and not trim into the live sole at the heel, obviously). It can take time and a lot of exercise before they look short like you think they should. Short heels are only a good thing if they are on an otherwise natural healthy hoof. 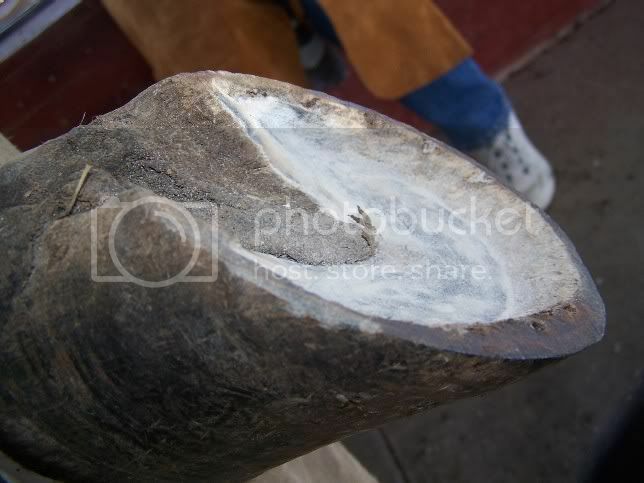 Short heels trimmed onto a hoof that has been trimmed long or shod for a long time is asking for trouble. Toes should always be trimmed short, down to the sole callous, then you trim the heels down so that the angle when you are done is no lower than the angle before you trimmed the toe. 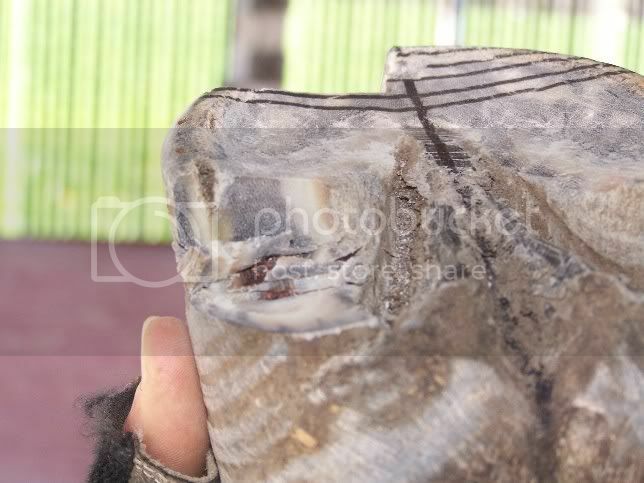 There's an exception with a hoof that has broken out chunks, where you have to guess at the natural angle but for the most part this keeps every horse comfortable for their own conformation. It also means I won't force a club foot down, because the foot is not causing the trouble or bothering the horse, so why argue with it? and more...please be as brutal as need be! Or maybe I'm too much of a bushie and out of date...? OH and if these pics are good for ermine spots etc please these are mine and I give permission for them to be used!! The hoof angles look okay, they match the pastern angles, and the heels match that too. 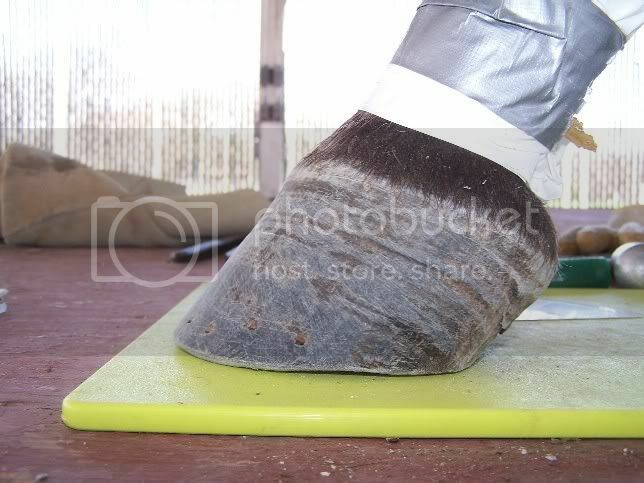 How sore the horse is depends on how long its feet were before they were trimmed imo, if they were really long then the trim would probably hurt, and they probably took too much off if they were significantly longer before. Ok, this is different, this isn't a heel issue. Dito on what CM said. 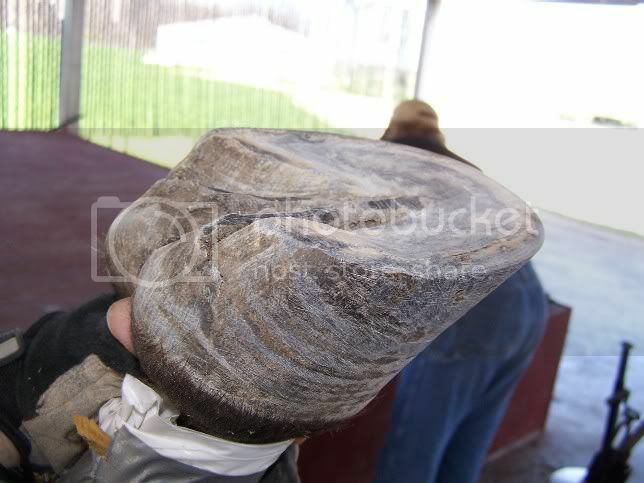 Those hooves are extremely short all around, which is good if it's a result of the hoof just being completely healthy. But you can't get them that short and still be sound without a tight trimming schedule for a long time and lots of excercize. Hard to tell from the picture angles but the wall on the fronts looks snubbed. A mustang roll is one thing but I see very little wall on the ground at all, ouch. The frog is huge, people ordinarily think of this as good but I see a frog that's trying to support the hoof (not it's job) . At least you are not seeing a strausserite's work(they wouldn't leave that much bar). Although he/she apears to be either lazy or doesn't own a hoof knife. :| I probably would have trimmed the bars down some (and I'm suspicious of excess sole in the quarter arches), but then, I wouldn't have trimmed the wall like that and so the bars and frog are trying to do a lot of the work. That crappy spot in the back of the frog is the result of bruising. Have learnt a lot from this post - thanks ! One thing you mentioned that torn area of the frog being a bruise? I commonly see torn looking frogs - is this always caused by a bruise? I can think of no other cause. That one is almost grown out though, you could take of that dead layer and it would be smooth. A lot of times I see that and the horse was never even lame. I like to clean it up when it gets to that point as it's packing in nasty black gunk and can grow thrush. 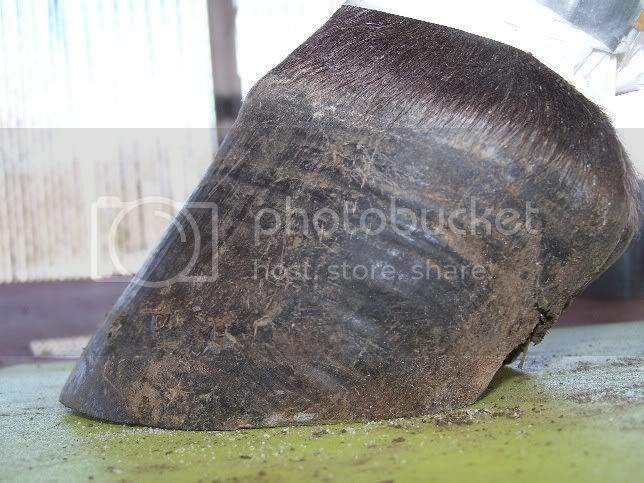 You'll see worse on a horse that had a really bad abscess in the heel, if it comes out the back there you can actually stick a hoofpick into the slit, then it grows down until it gets to ground level and starts shredding. The laminitic cushings horse I trimmed had a major bust out in one foot (to his slight releaf) and that whole frog will be shedding at some point. 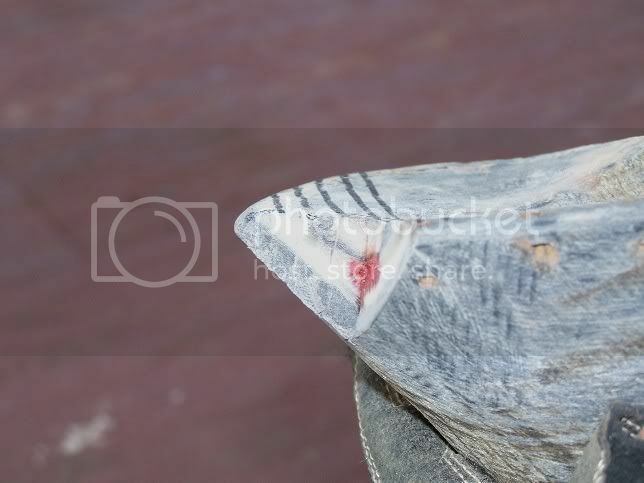 I've had the aftermath of one abscess result in shedding of half the sole, a bar and a good bit of frog. Scared the bejeeses out of me cause it was in my pre farrier days and I had no idea what had happened lol. ok so barefooter came back(!) to fix(?) the "problem" of the horse being lame...took its heels off...Now it can't walk at all WTF! !.......I decided owner is a dickhead! Won't get pics now as I'm "only" the trainer....I give up! Yea the problem of the horse being lame can only be fixed by letting the feet grow, not taking them shorter. Long heels were not going to make that horse lame alone, people really are not that smart. Edited to add that if it wasn't for the fact that he is a friend and farriers are like hen's teeth round here I would have lost him a way back !! OK so yesterday "barefooter" came back to do feet... I thought they could go another 3 weeks! (They look like they have just been done)...Anyway she has now done them so the only surface that supports the foot/horse is the frog.. The wall,sole etc is shorter!! I was told by the owner that "barefooter" thinks that because they (horses) don't show "bone structure" (ribs) that they are going to founder..... :BH They are even sore wearing Mac boots!! I am over it!!! Yep I know good farriers are hard to find but obviously impossible for my EXclient :hammer to find! The best farrier I ever had was actually the most horrid person and we did not get on at all..but when it came to his job he was brilliant! !